Public-service or government Internet services could be an important element in the NGI and provide an ideal way for government and other public agencies to improve citizen involvement and empowerment and increase the productivity and effectiveness of public services. The Internet Centre has a good relationship with the UK Government Cabinet Office e-Government Unit and is involved in the Cross-government Data Mashing Laboratory initiative that is exploring ways of making government data and services available for the public good. The Internet Centre is working with a medic, Dr Paul Nelson, to develop an Internet service, entitled phrisk, for the community support of suffers from chronic diseases, in the first instance people with diabetes. Phrisk will provide a community where diabetes suffers can enrol and share their experience and knowledge with like individuals. The point is to both empower patients to take responsibility for their condition and also to provide a supportive community so that no one feels isolated or alone. Phrisk will also provide a community ‘Wikipedia’ where experience, expertise and knowledge on diabetes can be accumulated and shared. The phrisk Diabetes Community Care Service. Phrisk will also include facilities for the electronic measuring, recording and monitoring of members’ conditions, not only blood sugar levels but also other life-style related factors such as blood pressure and weight. 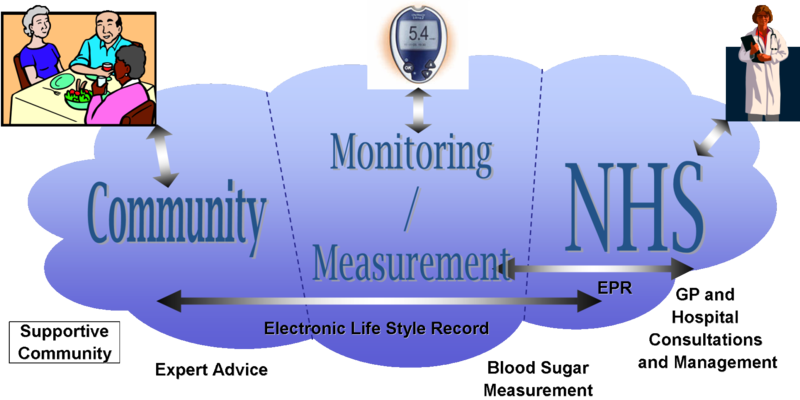 Analytic tools will be provided to allow patients to assess trends and compare their condition with statistical norms. This monitoring would provide a comprehensive record of a patient’s condition so that, when they see their GP the doctor would be able to make a much more informed and realistic assessment of the patient’s overall condition than they would relying solely on short and infrequent consultations. Phrisk is now in beta testing and we plan to release a live version soon. We believe that the development of such community services is the best, perhaps the only, way to increase community participation in public services and to achieve the growth in productivity and effectiveness of these services that the UK government is clearly seeking in return for its investment.